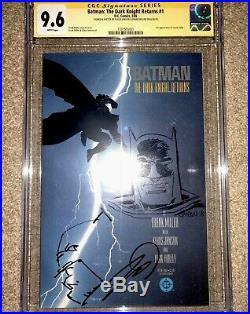 Killer double signed double sketch by Frank Miller & Klaus Janson. 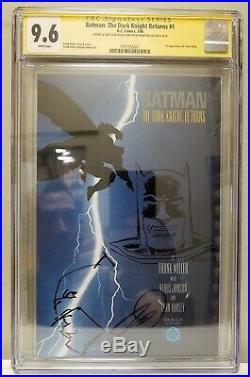 The item "Batman The Dark Knight Returns #1 CGC 9.6 SS 2x. Frank Miller/Klaus Sketch" is in sale since Friday, April 12, 2019. This item is in the category "Collectibles\Comics\Copper Age (1984-1991)\Superhero\Batman". The seller is "robertv4455" and is located in South Gate, California. This item can be shipped to United States, Canada, United Kingdom, Denmark, Romania, Slovakia, Bulgaria, Czech republic, Finland, Hungary, Latvia, Lithuania, Malta, Estonia, Australia, Greece, Portugal, Cyprus, Slovenia, Japan, China, Sweden, South Korea, Indonesia, Taiwan, South africa, Thailand, Belgium, France, Hong Kong, Ireland, Netherlands, Poland, Spain, Italy, Germany, Austria, Bahamas, Israel, Mexico, New Zealand, Singapore, Switzerland, Norway, Saudi arabia, Ukraine, United arab emirates, Qatar, Kuwait, Bahrain, Croatia, Malaysia, Brazil, Chile, Colombia, Costa rica, Panama, Trinidad and tobago, Guatemala, Honduras, Jamaica, Ecuador, Viet nam, Uruguay.